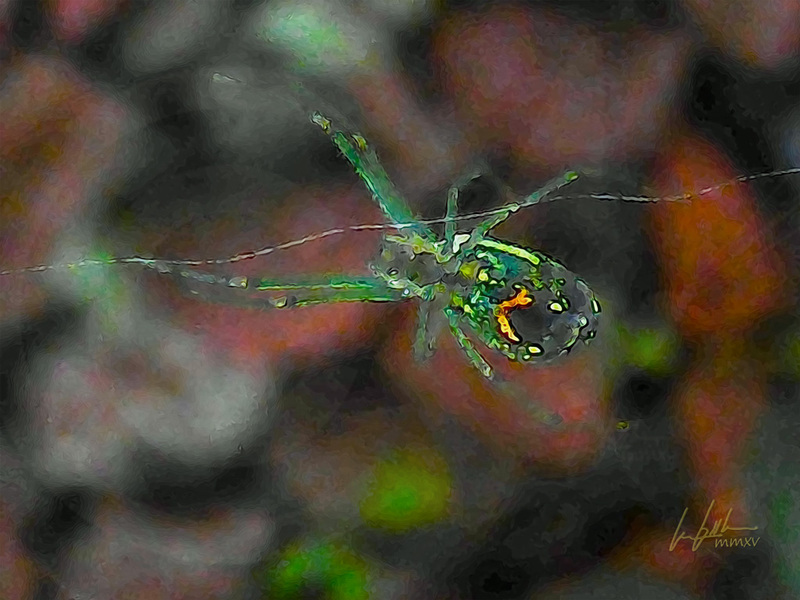 “The Orchard Silk”, is an eLITHOGRAPH, c.2015, of an orchard spider (Tetragnathidae – long-jawed orb weavers). The print measures 14.2″ x 10.7″ and prints simulating an oil acrylic. decades in the knowing and timeless in it’s soothe. The spider felt the line below it’s tiny feet tremble. The movement of her ‘line’ was her alert signal that the pantry was being stocked. But this movement was different. It carried a different message. Her brain and nervous system were not advanced enough to notice the change in the reggae beat as well. It began to skip. Then it stopped. In its place was the sound of silence. Silence everywhere. Then as quickly came the rumble. From down deep. The line under the spider’s feet began to spring. So erratic was the movement that the spider could hardly stay aboard. It just gripped and hung on. Then as quickly as it started, the springing was gone. It was over. There was a calm beginning to settle over the area. Then, the explosions began. They and the blinding heat; the shouts; the cries for help; continued on deep into the night – past the next day – and into the next night. The spider just continued to weave its web, collect the hapless insects that fell into its grasp and repair the damage caused by the strange dust everywhere. This happy little arachnid had no way of knowing that the gaping chasm just 30 miles to the west of her had forever altered the entire world beyond her silk-thread-world, for eons to come. Life was forever changed. But for the spider, fall was coming and she needed to prepare. Winter would be following soon and she had to get her eggs ready to weather the winter so they could hatch next spring. She would soon die, but her eggs were the next generation. That was what she knew. Nothing else mattered. “The Orchard Silk”, is an eLITHOGRAPH, of an orchard spider (Tetragnathidae – long-jawed orb weavers). The print measures 14.2″ x 10.7″ and prints simulating an oil acrylic.